This day had held for the disciples new revelations regarding their Lord. As they got into the boat and rowed toward Capernaum it was hard to stop talking about what they had seen. There were 5,000 men, plus women and children, and Jesus had fed them all! He fed them with nothing more than five loaves of bread and two fish, a lunch that a boy had brought with him. Not only did He feed them, there was plenty left over. The power Jesus seemed to command both thrilled and unnerved them. It was amazing for them to see the reactions of the many thousands. What went through their minds must have been thoughts of the Messianic Kingdom that they felt Jesus would proclaim and the uprising of the people at the command of the Conquering King Messiah against Roman rule. What might be their place in this Kingdom as members of the inner court, after all they were part of the inner circle. 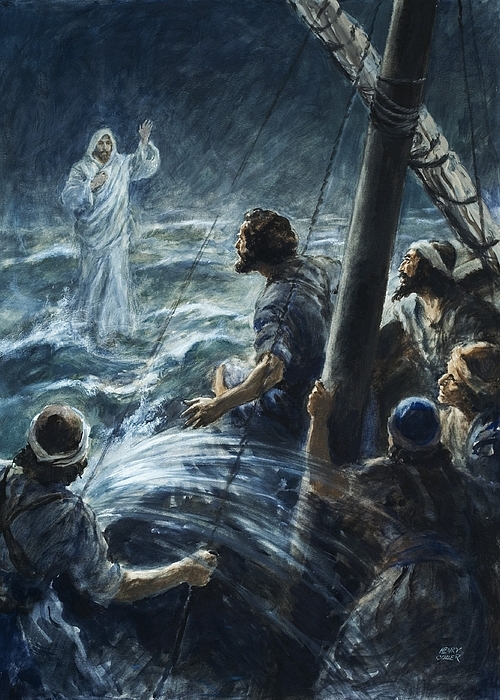 Yet, Jesus had dismissed the crowd, had gone off on His own and now they were on this boat and the wind and sea was rising fast. An onset of disappointment, confusion, frustration and fear must have begun to grip them. Jesus had gone off to pray to His Heavenly Father. As the twelve struggled with nature and their personal anguish and confusion Jesus prayed. At the close of His earthly ministry, Jesus told Peter, “Simon, Simon, behold, Satan demanded to have you, that he might sift you like wheat, but I have prayed for you that your faith may not fail.” (Luke 22:31-32). Peter and his fellow disciples were now being sifted. The Lord, however, was alone on the mountain in prayer to His Father. Although Scripture does not say, Jesus must have lifted them up in prayer. The twelve were chosen before time for the Father’s purpose. The twelve disciples were the constant object of Jesus’ concern, instruction, and training. It was upon their shoulders that the establishing of His church would soon fall, and He knew the time of their training for this task was short. On sending His disciples before Him to the other side He knew what was before them and He knew of their importance to the establishment of His church, so He prayed. Jesus would not have abandoned them, He tested their faith. The wind had turned Peter’s eyes away from Jesus. A weak faith faltered when danger challenged his faith that Jesus would be his protector – his faith failed. Peter began to sink when his faith shifted, and his eyes turned from Jesus to the precariousness of his situation. Jesus, however caught his hand and rescued him. Jesus questioned his faith and questioned how Peter could doubt His power to save him. Eleven of these men would need this faith, this trust and the recognition that Jesus was truly the Son of God. Eleven of these men would face persecution and or death for following their Lord. Eleven of these men would be foundational in spreading the Gospel message through the known world and not falter in their allegiance to their Lord. The Lord Jesus provided that faith to them and they believed to death. True saving faith is often mingled with much weakness and infirmity. It is a humbling lesson, but a very wholesome one. We have great reason to thank God that Jesus, our great High-priest, is very compassionate and tenderhearted. He knows our frame. He considers our infirmities. He does not cast off His people because of defects. He pities even those whom he reproves. The prayer even of “little faith” is heard, and gets an answer.